It was a failure and Garibaldi was sentenced to death. To avoid death penalty he decided to embark on a boat in the middle of the night, heading to South America . As soon as he reached Brazil, around 1840, he espoused the cause of the Republic of Rio Grande do sul fighting for independence against the Brazilian government. To this day a small Brazilian town is named Garibaldi in his honor. It was about that time that he met one of the most important women in his life, Anita. The couple moved to Montevideo, Uruguay, and, after a couple of years of a peaceful life, Garibaldi joined the local army in the battle against the Argentinean invaders. From 1842 and 1848, he learned how to lead an army, studied the tactics of "guerrilla" and, became more and more convinced that it was high time to start fighting for the independence of his own country, Italy. Garibaldi returned to Italy in 1848 to participate in the First Italian War of Independence in the North of Italy. 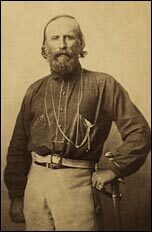 However, the Italians lost the war and Garibaldi decided to go to Rome to assist the Republican forces against the French. The city was kept under siege by the French army for more than six months during which the Republicans, led by Garibaldi, offered an heroic resistance. Eventually, all, but a small group of people, surrendered. The small group escaped in direction of the Apennines and kept fighting. The march through the Italian mountains was extremely tough and Garibaldi lost his beloved Anita during this terrible journey. It was time for him to leave Italy again as he was one of the most wanted fugitives in the country and entire armies where after him. He left for Morocco and, eventually, went to New York and, some time later left again for England. In 1854, once the "publicity" around his name became manageable, he decided to come back to Italy. Only four years had passed and he was back on the war front, appointed General, and fighting under the Piedmontese flag in the Second Italian War of Independence in 1859. The war ended unsuccessfully, and in 1860, just one year later, he decided to create the famous "Spedizione dei Mille" (Expedition of the Thousand) during which he headed a group of thousand volunteers to go to Sicily supporting the local people in their fight against the kingdom of two Sicilies (under the Bourbons monarchy). On May 11, the "Mille" disembarked in Marsala, Sicily. Garibaldi immediately reinforced his multifaceted troops with even more varied people coming mainly from the Sicilian countryside. Leading his army of farmers, craftsmen, idealists, journalists with few real soldiers and hardly any ammunition, he engaged in a battle against the powerful Bourbon-French army at Calatafimi. In this fight he proved his leadership capabilities on the field, exploiting all of his know-how of guerrilla tactics learned during the years in South America. The Bourbons were defeated and he declared himself dictator of Sicily in the name of Vittorio Emanuele II. Thanks to this success, more people joined his troops and he led them again to Palermo destroying an even much larger Bourbon army. Few weeks later, he crossed Sicily towards the Eastern town of Messina which was liberated after another successful victory. Riding the wave of success, Garibaldi crossed the sea and reached Italy's mainland in Calabria starting his march to liberate whole of Southern Italy. A couple of months later, he entered Naples and destroyed again the army of the Two Sicily Kingdom in the Volturno battle. Some time later he handed over all of his territorial conquests to the king of Piedmont, Vittorio Emanuele II. The formality just took the time of a handshake in the famous meeting of Teano (in the South of Italy). However, Rome was still under the Pope's leadership and defended by the French army. It was in 1867 that Garibaldi decided to lead a small group of volunteers who, under the banner of fighting to free Rome, marched on the city against the Papal army. This - last - expedition was not successful and Garibaldi was taken prisoner and then again returned to his house in Caprera. Toward the end of his life, he spent the vast majority of his time on his Sardinian island, restricted by his old war wounds and a very painful arthritis. He died there on June 2, 1882. Giuseppe Garibaldi (July 4, 1807- June 2, 1882), one of the most famous heroes of Italy's popular history, has been credited for being the man behind the unification of Italy in the late 1800s. Actually, the honor should be shared at least with one other person, namely, Camillo Benso Count of Cavour, who was the political mastermind behind the scene. Garibaldi started his traineeship as a skipper on the family's boat, but very soon he realized that "simply" becoming a trader or a merchant wouldn't fulfill him. After having met with some members of the "Giovane Italia" movement (a revolutionary movement fighting for Italy's independence) led by Giuseppe Mazzini, Garibaldi decided to engage in insurrection in Piedmont.